Shrubs growing in containers add a feeling of maturity to a deck, courtyard, or patio. Larger specimens provide height and structure and can also help create privacy by acting as a living screen. Evergreen shrubs offer interest in winter when herbaceous perennials, tender bedding, and patio plants have faded. Some varieties will also provide long-lasting summer interest in the form of vibrant leaves or abundant blooms. All can be used either as a focal point or as part of a backdrop for pots of seasonal bulbs and flowers. If you don’t have the right soil conditions to grow acid-loving plants such as camellias, pieris, or rhododendrons, growing them in pots of ericaceous compost is the perfect solution. Large pot with drainage holes (must accommodate the shrub’s root ball, plus have 8–10cm (3–4in) space all round). Smart feature Clip Box (Buxus sempervirens) into a ball for a smart feature on a shady terrace. Mediterranean feel French lavender (Lavandula pedunculata subsp. pedunculata) is a long-flowering, aromatic shrub for full sun, with violet blooms through summer. Long-flowering display Hydrangea petiolaris ‘Preziosa’ is a narrow-leaved mophead hydrangea, with dark stems and red-tinted foliage. It flowers in summer and autumn; pink darkening to burgundy. Stylishly delicate Japanese maple (Acer palmatum) has delicately cut leaves in colors from deep purple to pale yellow, green, or amber. Shelter from wind. Fragrant evergreen Mexican orange (Choisya x dewitteana ‘Aztec Pearl’) is a compact evergreen with scented white flowers in early summer, often repeating. Cover the holes in the base of the pot with a few crocks or stone chippings. This prevents compost being lost through the holes or blocking them, which will hinder drainage and cause water-logging. Pour in sufficient compost to allow the shrub to sit at the right height in the pot. Leave at least 2½cm (1in) between the top of the compost and the rim for watering, more if you are adding a gravel mulch. Plunge-water the plant, remove from the pot and check the roots. 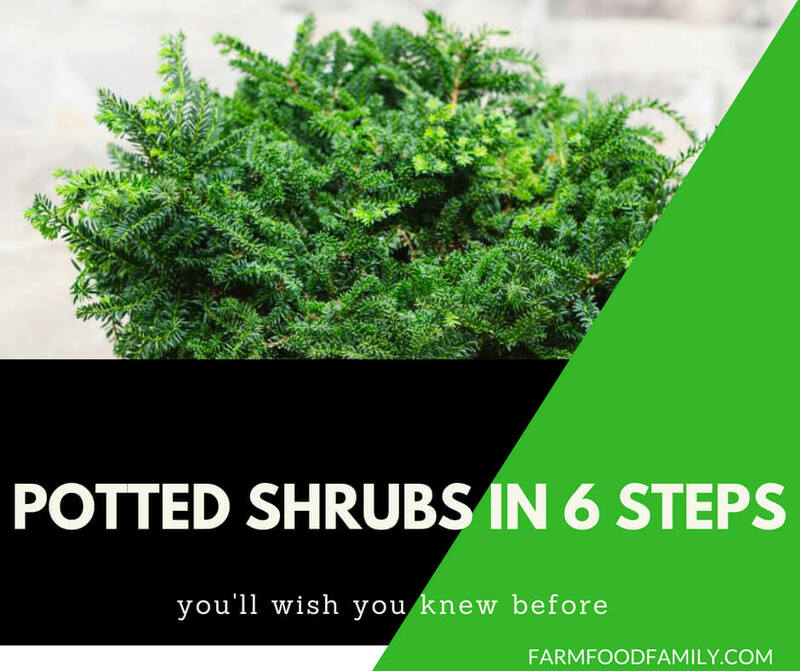 Do not disturb the fine roots of well-grown shrubs, but gently loosen any thick roots wound around the base. Mix some slow-release fertilizer into the compost and set the shrub in the middle of the pot. Back-fill with compost to the level of its original pot. Firm lightly. Gently water the pot to settle the compost around the roots. To avoid displacing the soil, pour the water over a piece of broken pot set on the surface. Scatter a layer of gravel on top of the compost to help keep down weeds. Fine chipped bark is a good choice for acid-loving, woodland species.